← 3 Weeks Old BIS & Grand Champion Winner Anyone? 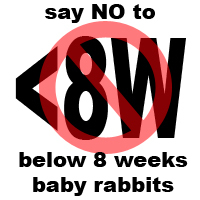 It took me a while to decide on posting this post and the reluctance was mainly due to the reason that I do not wish this taken as a reason by unscrupulous breeders to pass on inferior stocks. In my opinion, it is never right and ethical to pass on inferior stocks to a fellow and especially new breeders. On the other hand, we cannot deny the fact that it is almost impossible to find a perfect Holland Lop and if there is, we shall all cease to breed. All faults must be made known to the person you are passing your rabbit to and in the case of the new breeder, they should be given pointers so they can also improve the quality of their herd. Being in the hobby for quite sometime now made me realize that not everyone is able to obtain good stock to begin with. I for one have had the first hand experience of tirelessly working to improve the many limitations passed onto me. I must also mention that it was through the generosity of friends in this hobby that has helped me find improvements to my work. For that, I am forever grateful. Like many of you, it was very costly for an average person like me to obtain good stocks from the USA and I must say that it was made harder in the beginning of my journey NOT knowing the many generous and kind people I have met along the way through the years. The many wonderful friends I met in this journey taught me many lessons because they have the best interest of the breed in their hearts. I do not wish to praise myself or brag of my achievements but I hope this post will act as a reminder to new and aspiring breeders in this hobby not to give up and I also hope this post can be an inspiration to them in their strive for perfection. It does not give anyone the reason to start off with inferior stocks especially now that we have so many good lines of Holland Lops to choose from in our home country, Malaysia. “Choosing The Best Foundation Stocks That You Can Afford” remains the motto of this hobby. Also, with this post, I hope to make it very clear to the general public the MAJOR difference between “BACKYARD/MONEY CRAZY” breeders and Hobbyist breeders. 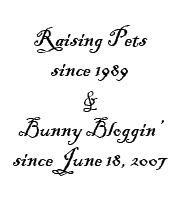 Most of us have read the many “REASONS NOT TO BREED” or “ACCEPTABLE REASONS TO BREED” in many websites/weblogs that advocates responsible Pet ownership/breeding. Some may even mention the #1 and only reason why people should breed their pets – IMPROVEMENT OF THE BREED without clearly stating what it really means. Here I would like to not only put it into words but also in the form of the TIMELINE diagram what “IMPROVING THE BREED” really means. For all my readers who have followed my weblog from day 1, you have gone through the many ups and downs with me. 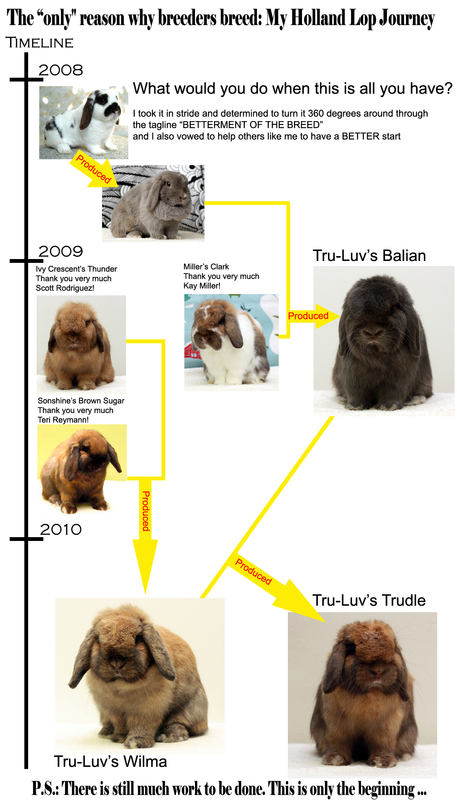 But lately, because it is a weblog with postings in chronological order, even I have failed to see how powerful it has been taking a good look at the many rabbits that have been produced through planned and minimum breeding here over at Tru-Luv Rabbitry. It was not until yesterday that I was inspired to put it on a timeline what I have achieved after 3 years. Three years is a mighty long time due to the limited stocks that I have and especially with a bad start that has made me lost considerable amount of time. I would not change a single thing and experience thus far. In fact I am grateful for the many lessons I have learned – good or bad. Each experience made me stronger. I have many people to thank in this journey and for the record, although the timeline diagram/picture that I am about to share only mentioned a few good people, the future of Tru-Luv Rabbitry has been greatly improved by the many wonderful friends who I have mentioned in my other post entitled – “I just can’t thank all of you enough“. The diagram/picture do not mean that their contributions goes unappreciated because they are not mentioned. In fact, they have planted seeds that will blossom in due time when I will be happy to mention then, my progress with their great help. I needed very concrete materials to prove my point, which is, the ONLY REASON WHY WE SHOULD breed.